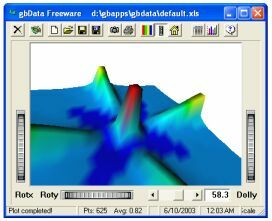 gbData provides colorful plots of 3D surface data. Data is entered using a simple Excel-compatible spreadsheet. The resulting 3D surface plots may be viewed, rotated, and copied to the clipboard. A variety of other data, spreadsheet, and image manipulations are available.